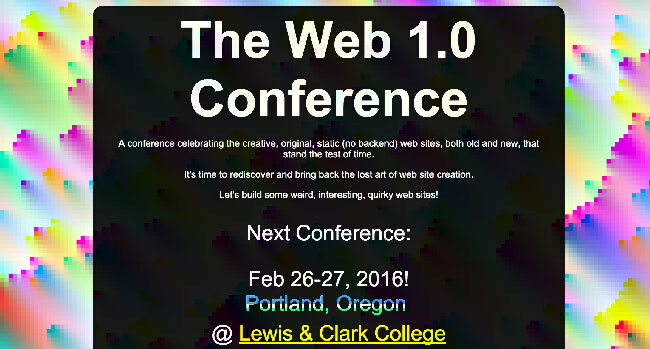 Web 1.0 Conference Lewis & Clark College Edition! The Web 1.0 Conference is a celebration of old style static websites. This month, I’m excited to announce a special college edition of the Web 1.0 Conference! I’ll be travelling to my alma mater, Lewis & Clark College this Friday and Saturday to host a conference helping people to build websites! What is the Web 1.0 Conference? It’s a conference celebrating the creative, original, static (no backend) web sites, both old and new, that stand the test of time. It’s time to rediscover and bring back the lost art of web site creation. Let’s build some weird, interesting, quirky web sites! 7:30PM Website show and tell – show us your first or favorite 1.0 website! Amber Case, Lewis & Clark College ’08’ (caseorganic.com/@caseorganic) Kickoff and conference introduction. Kyle Drake, founder of Neocities (kyledrake.net/@kyledrake) Introduction to Neocities, why we need to bring back the creative web, and the future of the web. Tickets are $5, which covers expenses. This conference is for students only, but exceptions can be made, especially if you’re part of the community and would like to be on hand during the day to help people with their websites! If you’re up for it, message me @caseorganic! what people made at the last Web 1.0 Conference!